The Locations directory theme comes with “Easy Install” built-in. Once you activate the theme, click this button and it will magically turn your site exactly like the theme demo. 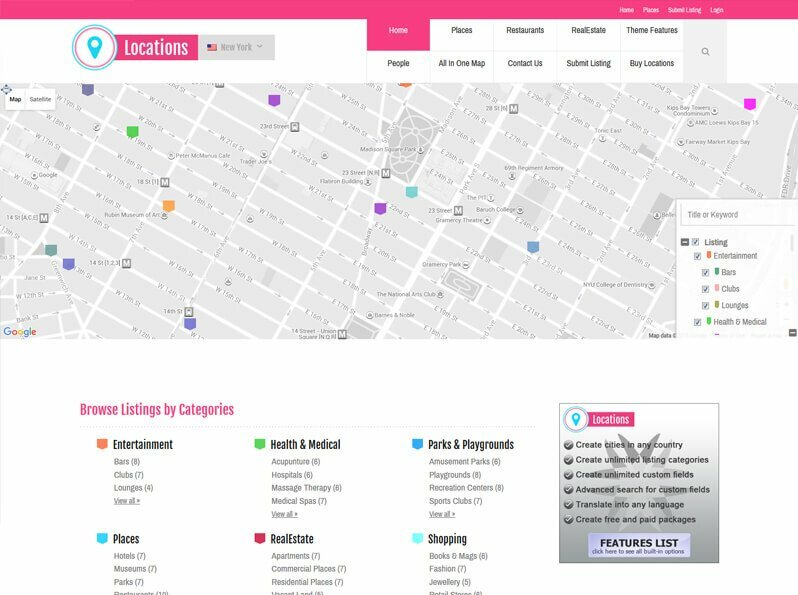 Locations is part of our 17+ WordPress directory themes collection. All of these powerful themes are responsive and highly customizable. 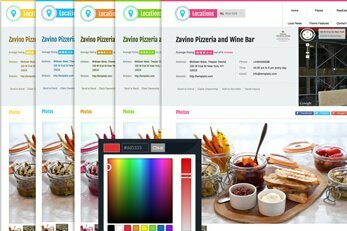 You can literally use Locations or any of the other directory themes a local business directory or for almost any type of listing portal you like. Changing categories, fields, locations, text and submission packages gives you total freedom on what you can use our directory themes for. 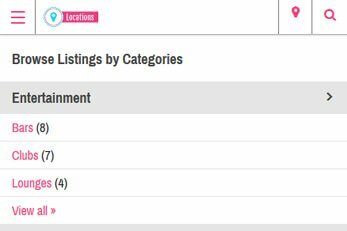 International listing directories are possible too, you have full control on the location manager which can have 1 or thousands of cities. 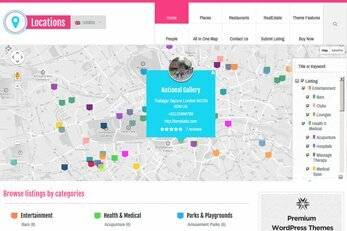 Locations is a beautiful child theme for one of the best CMS themes out there, Directory. Being a child theme, Locations comes with all of the built-in features the Directory theme has. You get styling of Locations in case you’ve already bought Directory and wish to install this child theme. In case you haven’t, Locations comes with Directory when purchased on the Standard or Developer license. You only need to activate the Locations child theme, insert the sample data and you have yourself a theme like the demo. 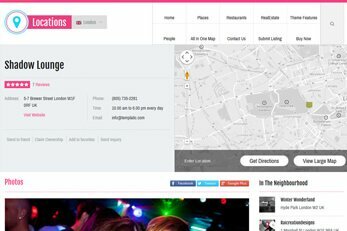 This small business listings theme is responsive but it also comes with its built-in mobile app view. This option gives you the choice to make the theme look like mobile apps when visited from any mobile device. 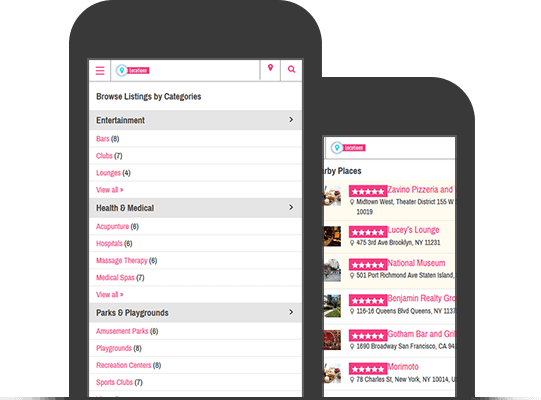 The mobile app view gives your business places directory a cool minimized look for mobiles. The mobile app view is optional so even with it switched off, your website will of course still be responsive. See the Locations theme on the mobile version on the here. 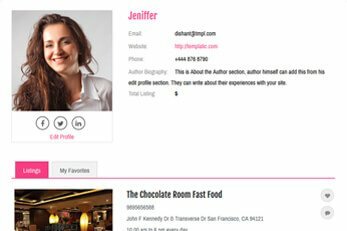 Use Locations to build that fantastic and profitable directory for business today. It doesn’t matter if you’re starting a directory for local business, international ones or those in the whole state or country. Locations comes with many flexible options, the choice is yours. 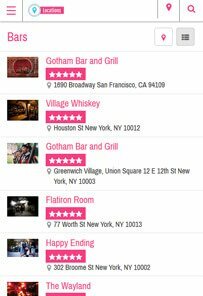 See below just some of the great built-in monetization options you get with Locations. Create unlimited business listing submission packages to suit your directory. Offer businesses single or subscription type listing submission packages. 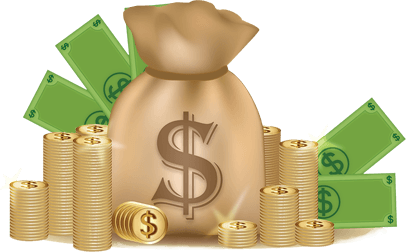 Recurring payment options available on submission packages. Publish AdSense banners or any other banner ads in several widget locations. Claim listing options with automated process on approved claims. Offer featured listings as extra charge or included in package price. Set extra charge for specific categories. Applied on top of package price. Create unlimited custom fields which can be made search by criteria ones. 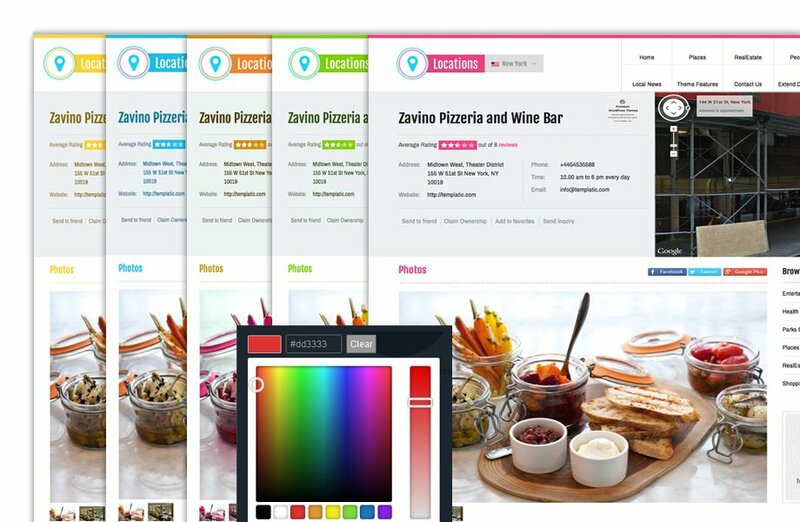 This theme is coded for best site ranking so your directory will get maximum online exposure. 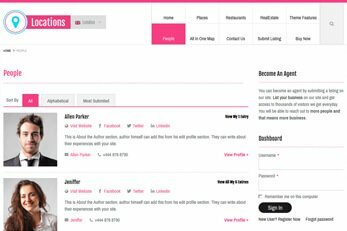 As well as the homepage, inner pages, the blog posts an categories, business categories and listings can all have individual Meta tags entered using the free Yoast SEO plugin. 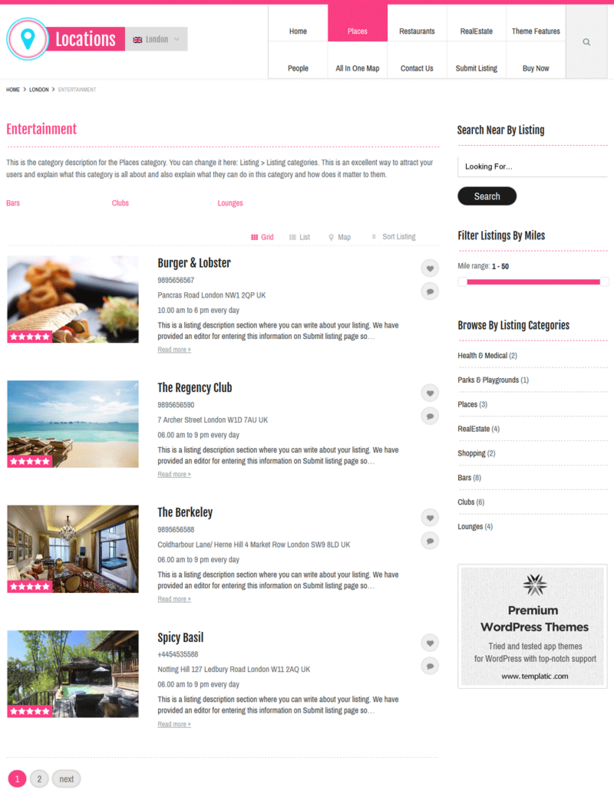 This local business listings theme also supports the best free SEO plugins such as the All In One SEO, Google XML Sitemaps and All In One Schema.org Rich Snippets plugins. Locations Is Translatable And WPML Ready! Need to create your business places directory in other languages? No problem, Locations is WPML ready. This plugin lets you run a multilingual website. You can also translate this theme into any other language instead of English. You don’t need WPML to do that, using the provided .PO and .MO files, you can apply your translations and change all text on the theme. 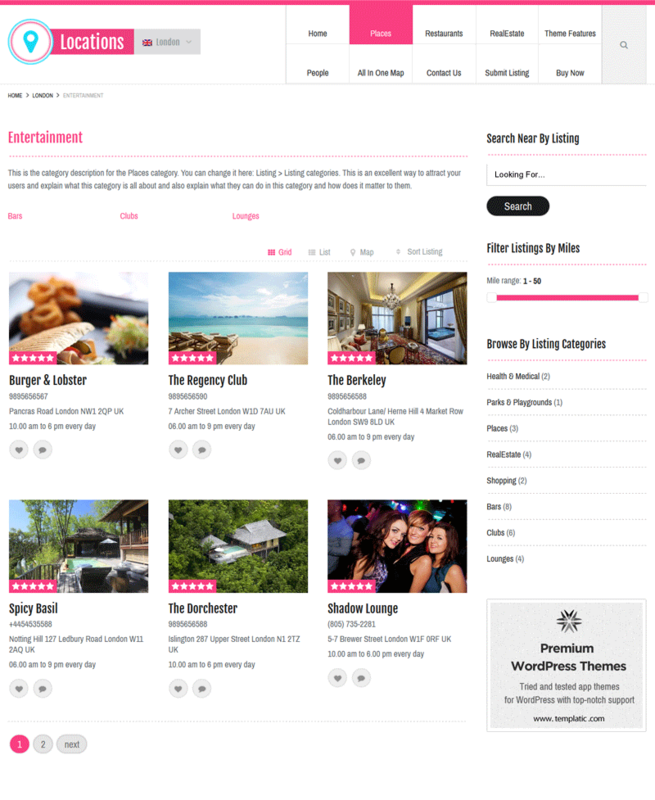 The Locations theme is compatible with some of the most popular WordPress plugins too. Just some of the features that make our WordPress Directory Theme Platform the most powerful and feature-packed among all. Use our free plugin which works in .CSV format to import or export business listings or cities. This tool is great if you’re thinking of adding listings as admin to help get your directory started. Control all aspects of your website from one very powerful admin dashboard. You control everything straight from the dashboard, no coding required. 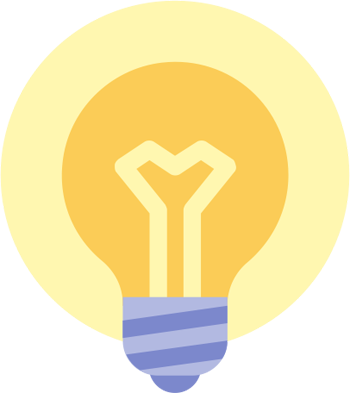 Disallow or open up or front-end submission to allow local businesses to submit a listing on your directory. As admin, you can add listings from both, front and admin dashboard at any time. As no directory software or theme is any good without search options, Locations scores well here. Choose from search widgets for simple and configurable advanced search by criteria. Includes several areas where your users will see a map. 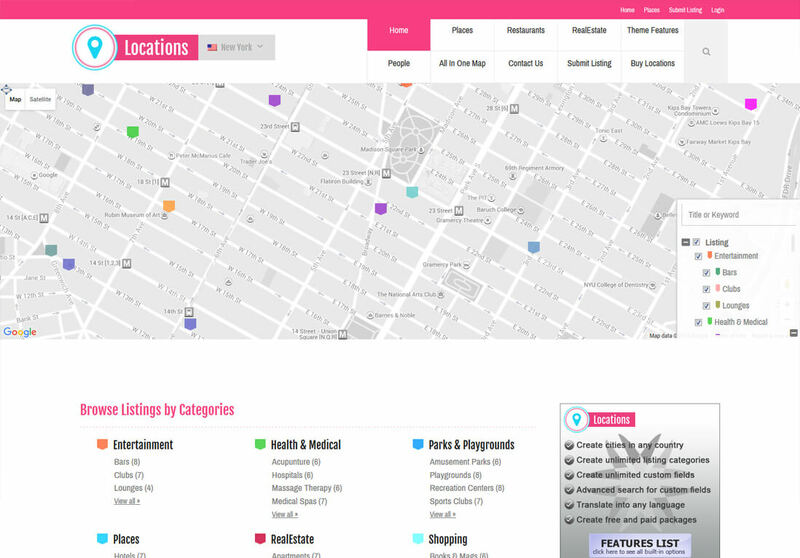 Map locations include: listing detail, categories and search result pages. 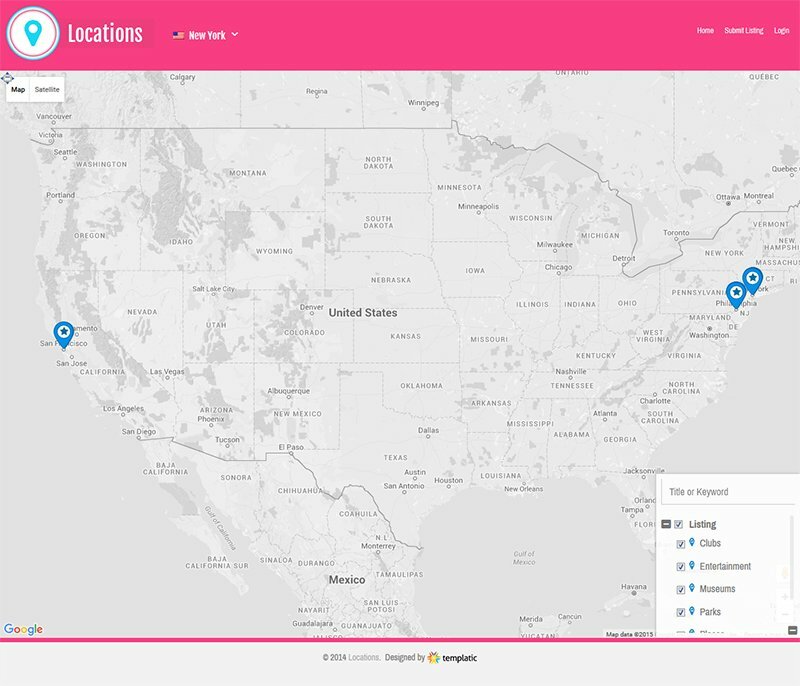 Locations also comes with the All In One map page like the Directory theme. To make your directory website the suitable for any type of business, industry or niche, custom fields can be created. New fields can also be searchable ones and category smart on advanced search. Enable or disable user registrations on your directory. As admin you can manage all users and have access to their listings from your admin dashboard. 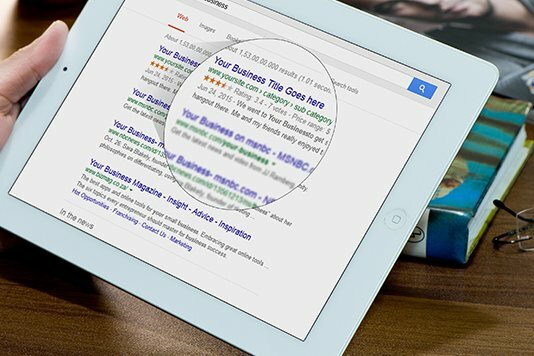 As you run a local business directory, you wouldn’t want to be stuck managing listings. Each user gets their dashboard and can manage their own listings. 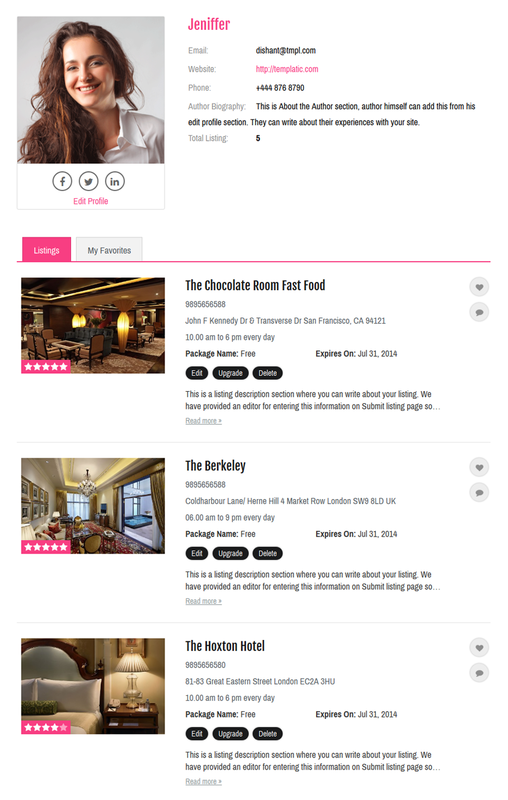 As all of our Directory themes, Locations comes with a powerful rating and reviews system. 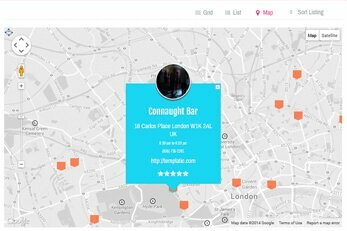 This is built-in and allows users to leave reviews and rate each business listing. You have access to edit all of the theme’s automated email notifications. You can edit any of them with your preferred text messages straight from your admin dashboard. 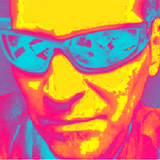 Change theme default color scheme and choose the colors you want from a color picker. This theme utilizes Google Fonts to give it this beautiful look. 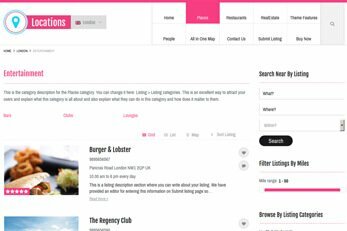 The Locations theme offers you endless possibilities for the type of listing directories you can use it for. Designed as a listings directory theme with business reviews, you can use it for all almost type of directory or guide. 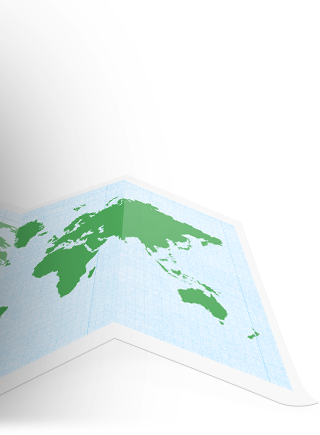 Locations give you total freedom when it comes to customizing the categories and the submission form fields. 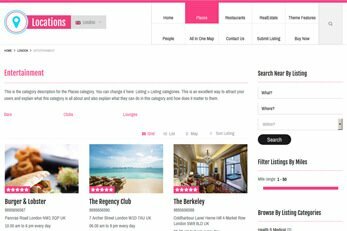 This is an ideal directory theme for local or international businesses, places, industry, hotels, restaurants, clubs, city guides, travel, properties or services. The sky is the limit for what you can use this listings directory theme for. 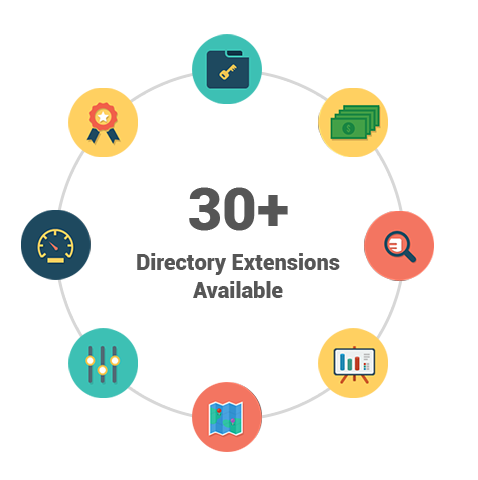 Locations includes plenty of built-in features but if you need even more functions, you can choose from 30+ advanced paid Directory extensions which are designed to extend the functionalities of your directory even more. 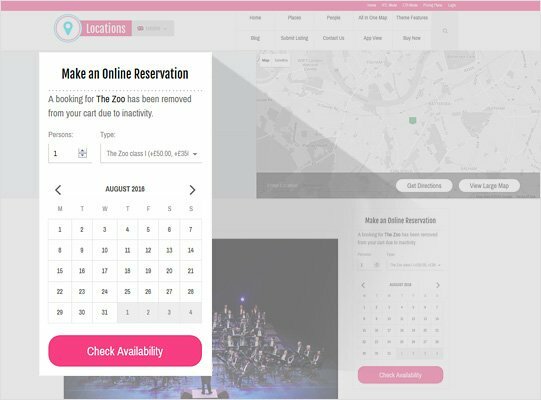 Need to offer a powerful reservation and booking system on your directory website? The PayPal payment gateway is included with the Locations theme. We also offer you the choice of 15+ compatible paid payment gateway add-ons. These optional plugins help you accept payments with more of some of the other popular payment gateways. Get hold of the powerful Locations WordPress theme and start your amazing online directory today. Built with eye-catching design and packed with amazing built-in functions you would expect. Locations is the one-stop solution for directories.